MONTE CARLO, Monaco -- At the end of the second day of the IAAF Council’s two-day autumnal session in Monaco, the Ukrainian city of Donetsk was this afternoon awarded the 2013 IAAF World Youth Championships. 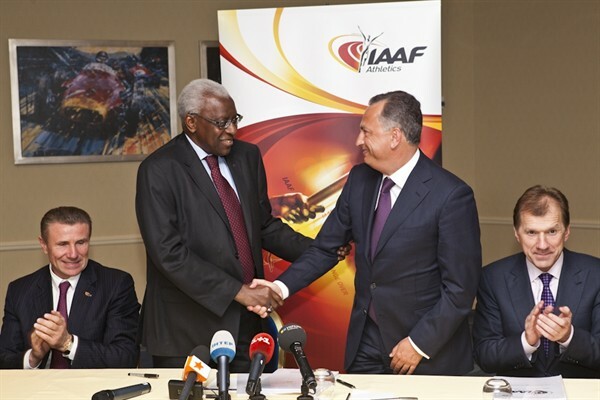 Donetsk to host 2013 IAAF World Youth Championships. Centre: Lamine Diack shakes hands with Borys Kolesnikov, that are flanked Sergey Bubka (L) and Ravil Safiullin (R). Leading Donetsk’s celebrations were Borys Kolesnikov, the Vice-President of Ukraine who flew into Monaco today to present to the IAAF Council the city’s bid to host the championships. Kolesnikov, who is the President of the Bidding and Local Organising Committee, was accompanied to Monaco by Ravil Safiullin, Minister of Family, Youth and Sports of Ukraine, and a Ukrainian press core of 15 journalists including three TV crews. Home to the annual ‘Pole Vault Stars’ indoor meeting, Donetsk has witnessed many World indoor records including three by 1988 Olympic Pole Vault champion and nowadays IAAF Senior Vice-President Sergey Bubka, whose club organises the meeting, and so the city is already a well-established venue for the athletics’ elite. As far back as 1977 the city staged the European Junior Championships, though visitors arriving in 2013 will find a fast changing Donetsk as the UEFA Euro 2012 football tournament has brought about a transformation in its transportation, public and sports infrastructure, with plenty of new hotels and a new airport being built. The athletics credentials of the bid’s backers could not have been stronger as Valeriy Borzov, the President of the IAAF Member Federation for Ukraine, like Bubka is also an Olympic champion, the winner of the 100m and 200m titles in 1972. “What impresses me most is their enthusiasm especially that their Vice-Prime Minister has flown to Monaco for this presentation, and their bid is backed by such Olympic stars as our great friends Sergey Bubka and Valeriy Borzov,” confirmed President Diack. “For the last 3 to 4 years we have discussed the possibility of making a bid for a World Championships and the Vice-Prime Minister has always been very enthusiastic about this project,” confirmed Sergey Bubka, the six-time World outdoor champion. Donetsk is the current home and training venue to many of the best athletes of Ukraine including Olga Saladukha, Denys Yurchenko, Maksym Mazuryk, Iryna Lischynska, Natalia Tobias and Yulya Krevsun.